(15/P24) TRENTON – New Jersey State Forestry Services advises residents that the seasonal prescribed burning program is under way. The controlled burning program, implemented by the New Jersey Forest Fire Service, is an important part of the state’s strategy to reduce risk of wildfires that could threaten property or lives. Prescribed burns are taking place today in parts of Cumberland, Burlington, Ocean and Monmouth counties. Weather conditions and other factors play a significant role in determining how much notice can be provided to the public about burns. The Forest Fire Service, part of the DEP’s Forestry Services, expects to burn about 10,000 acres of forests and grasslands this season. These fires burn brush, leaves, needles and debris but do not reach the canopy of the forest or cause significant tree loss as wildfires do. They improve forest health by removing thick undergrowth and competing non-native trees that can harm the overall health of the forest. “Prescribed burning is just one practice that State Forestry Services relies on to maintain overall forest health. When combined with insect and disease treatments, habitat restoration, and carefully executed management plans, our forests will provide a greater diversity of habitats for wildlife, and create safe recreation opportunities for residents,” Fleming said. 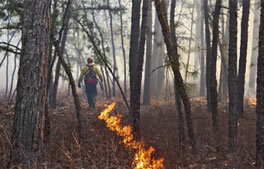 Prescribed burns, which are part of New Jersey’s Statewide Forest Resource Assessment and Strategies, are carried out by highly trained and experienced firefighters, under exacting weather conditions and with the necessary support equipment. Prescribed fires are generally conducted during the winter months to minimize the amount of smoke produced, and when weather conditions tend to be safer for controlled fires. These burns help reduce forest fire risks prior to entering the prime wildfire season, which in New Jersey generally begins in early spring, when leaves and debris are abundant, tree cover is sparse and conditions tend to be windy. During the burns, firefighters employ best practices to manage smoke impacts but nearby residents and forest visitors should expect temporary smoke in the vicinity of any prescribed fire activity. Media interested in seeing prescribed burns in action and talking to experts from the New Jersey Forest Fire Service can make arrangements through the DEP’s Press Office at the numbers above.